(1) In the occupant classification system, the occupant classification ECU calculates the weight of the occupant based on signals from the occupant classification sensors. This system recognizes the occupant as a child if it detects a weight of less than 32 kg (70.6 lb), and disables the front passenger airbag and front seat belt pretensioner RH. (2) This system is mainly comprised of 4 occupant classification sensors that detect the load on the front passenger seat. 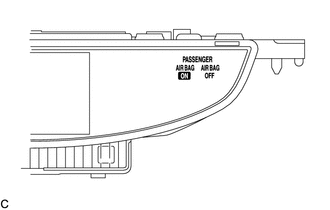 The occupant classification ECU controls the system, and the passenger airbag ON/OFF indicator indicates the ON/OFF condition of the front passenger airbag and front seat belt pretensioner RH. 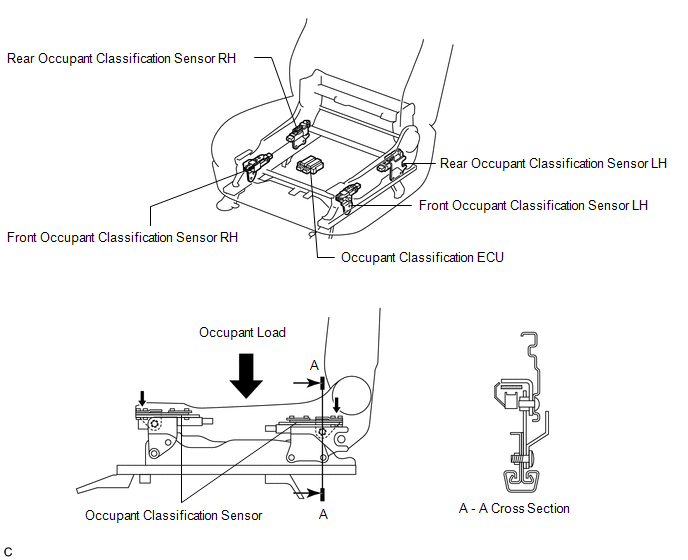 (1) The occupant classification sensors are installed on 4 brackets connecting the seat rail and seat frame. Accordingly, when load is applied to the front passenger seat by an occupant sitting in it, the occupant classification sensors register a distortion. (1) This indicator informs the driver whether the occupant classification ECU puts the front passenger airbag and front seat belt pretensioner RH into an active state or inactive state. (2) If a malfunction occurs in the occupant classification system, the passenger airbag ON/OFF indicator ("OFF") and the SRS warning light come on.